Raw materials are transferred to bins with variable speed dosing scales. The flow of each is automatically controlled by an online analyser to ensure uniformity of chemical composition. The raw materials are fed to the four-roller vertical mill with a capacity of 465 tph, using a high-efficiency separator to reduce the mill’s specific consumption, and then to the 10 000 t homogenisation silo for the storage of the raw meal. An airlift system is used to propel the raw meal from the silo up the 135 m, five-stage, two-string preheater tower, equipped with stack gas analysers at the chimney and at the entrance of the kiln. McInnis uses the latest technologies to control its air emissions to meet the emission levels prescribed by the US Environmental Protection Agency’s National Emission Standards for Hazardous Air Pollutants (NESHAP) – New Plant 2015. "The Start of Something New: Part 2"
The preheater tower also includes a calciner with an optimum residence time to promote efficient calcination and reduction of NOX formation. The hotmeal is then transferred to the two-pier rotary kiln, 75 m long and 5.2 m in dia., to complete the clinkerisation process. The kiln has a nominal capacity of 6000 tpd. The clinker then passes through the Polytrack cooler, with a mid-cooler crushing system, before it is transferred to one of three 40 000 t clinker silos. In addition to normal secondary and tertiary air recovery technology, the plant also recovers excess heat from the clinker cooler to meet the needs of the cement mills. The McInnis Cement project is not limited to the production site in Port-Daniel–Gascons. It also includes an entire distribution network, deployed in northeastern North America, supplied by the deep-water marine terminal connected to the plant. 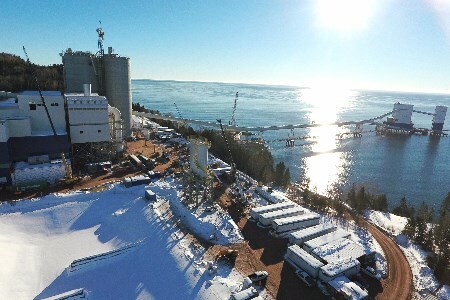 Although temperatures are rather cold in the region during the winter months, the waters around the terminal do not freeze, allowing for continuous shipping and receiving activities throughout the year. Moreover, to offset the potential loss of the lobster habitat caused by the construction of our offshore facilities, McInnis has built four artificial reefs, made of stones of various sizes, in an area showing poor marine life, 1.5 km east of the terminal. From the first year of their installation, the structures have fostered aquatic life and the young lobsters have already adapted to them, to the delight of the fishermen who frequent the zone. The terminal has two main platforms and 14 secondary platforms, all mounted on piles with anchoring keys. The construction of the terminal in a marine environment required a variety of environmental protection measures, including the monitoring of marine mammals by biologists, to avoid potential sound impact on these species during construction. At 400 m from the shore, the berthing dock will accommodate various vessels, ranging from 10 000 t barges to 60 000 t ocean vessels. Reception of raw materials takes place at 1000 tph, while cement loading can run up to 1400 tph, via two towers equipped with articulated loading arms. The installation allows a vessel to be loaded without having to move during the procedure. It is from this terminal that the ships depart for the other distribution facilities of the McInnis network. The terminal in Sainte-Catherine, Quebec, is already in operation, while construction is nearly completed in Providence, Rhode Island. Other locations will gradually complete this network, including a location to serve the New York market. Work is also underway in Littleton, Massachusetts and Oshawa, Ontario, two locations that will join the network during 2017. Telling you how much the past few months have been intensely lived by all employees and construction partners would be an understatement. Every morning when I arrive at the plant I am reminded of the many challenges that have marked our journey, and the hard work and concentration that were essential to reaching the beginning of commercial operations. As the adventure of building and commissioning the plant fades and becomes a part of the past, and as McInnis’ product enters the market and into the hands of its customers, it is clear, at McInnis, that now is the beginning of the future. This article first appeared in World Cement's May 2017 issue.